January is almost three quarters of the way through. I didn't set New Year’s resolutions, but I spent some time feeling into what my intentions are for 2018. After almost a month of this year (where did that GO?!) I have a few ideas. As a life coach who specialises in rest and renewal I always have rest and renewal at the forefront of my mind. It’s a constant practice – I am always resisting the drive to work, work, work and to be 100% consumed by whatever I’m committed to doing at the time. I can’t do that anymore – I balance my coaching business with my academic work and most importantly, my family and my home life. I simple CAN’T work with the hustle and pace that I used to. So that’s not my primary intention for 2018 – it’s a constant and ongoing practice. It's always important to realise that how we think and the intentions we set, influence our entire lives. That might include our capacity to decrease stress, manage our time better, embrace self-care, become a leader and even how we embrace our personal lives and time with our families. This post is about making a commitment to myself and my life. It’s about creating an intention to live with abundance, rather than scarcity. In what way do I mean? My intention for 2018 is to realise that sometimes, enough really IS enough. Let me clarify what I mean by this. I always encourage people to visualise their perfect life. You should allow yourself permission to dream big and take (and subconsciously create!) the opportunities that then present themselves to help you get there. Don’t get me wrong – I do this EVERY SINGLE DAY of my life. I’m a dreamer, I’m a planner, I’m a goal setter and I visualise what I want for my life and my business and my work every single day. It is part of my morning ritual. My sacred practice. Visualisation and reading my affirmations forms a very inspiring and very important part of that. But something happened when I really started focusing on my visualisation more throughout the day. It’s something that I didn’t particularly like and didn’t feel particularly good to me. I spent more of my time wishing that what I visualised was my life now and becoming critical of those aspects of my life that were not where I wanted them to be. I realised that so often I was looking at my life and aspects of it like it wasn’t yet enough. My financial situation wasn’t enough. I knew I would be, but I found myself WAITING until what I visualised came true. Outside of that sacred visualisation practice I had moments of being critical, impatient and negative, rather than accepting, grateful and positive. How could a sacred and amazing visualisation practice lead me into a scarcity mindset???? 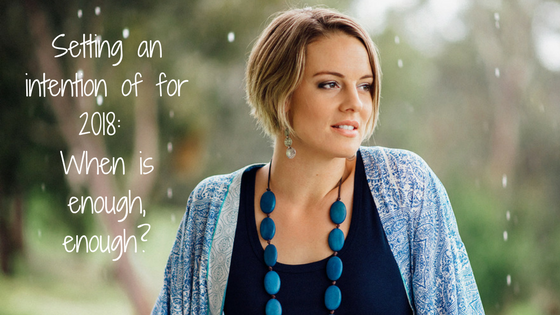 ….. when is enough, enough? I knew something had to change when I was browsing real estate directories from my computer one day. A bit of background for you first. My husband and I discussed living where we live at length when we decided whether or not it would be worthwhile to renovate, knock down and rebuild, or sell and move elsewhere. We did a list of pros and cons, and we decided that we wanted to stay, because we loved having our kids growing up in the bush, we loved having native animals around us, and we loved having space. Truly. Because we dreamed of our beautiful home, I would often browse pictures of gorgeous homes, admiring gardens, studios, and finding myself saying, ‘oh, but we could move into a house like this, or a house like that’. Or ‘now I’m not sure of what we’ve planned and dreamed for this place’. Every time I browsed those pages I found myself noticing all the things that I didn’t have in my house right now, and wouldn’t, even after we had built our beautifully designed home. One day I was doing this exact thing and my husband said to me, "Kate, when are you going to be okay with what we're living in now, and what we've planned to build?" I know that there are so many things about our home right now that need to be fixed. It’s draughty in winter and hot in summer, it’s made of shed palings and lots of things aren’t ‘finished’. It’s a bush cabin - but coincidentally that’s part of what made me fall in love with it in the first place. I had been focusing so much on what I didn’t like, that I wasn’t focusing and realising how what I have right now - my beautiful, eclectic, bush home – could actually be ENOUGH. Enough for us while we have little kids drawing all over the walls (it’s amazing how relaxed you get when you know you’re knocking it down and rebuilding!). Enough for us while I’m working less than when my kids are all grown up. I don’t want a huge house with a huge mortgage so that I have to work all the time while they’re little. Enough for us while we save for building our new home. Enough for us while our kids grow up in the bush and all the amazing things that come with that. So I made a conscious choice – with my home, and with my life – to be OK with what I have right now. Even more than that, to find joy and happiness and gratitude for what I have right now. To know that despite dreaming for more or something different, that it can and IS enough for me right now. Now instead of being critical of the elements in my property that frustrate me, that I want to change when we do eventually build, I try and focus on the things that I love. Which parts of the house feel most comfortable, and homely, and relatable. I've realised that I don't need to open those tabs on the computer, because I have the power to create the home that I want to, RIGHT NOW. And so, I'll do that by designing the house that I want to when we rebuild. There are so many ways to appreciate what we have RIGHT NOW and still dream of the future. Since that choice I’ve been noticing how much better I feel about those aspects of my life that yes, I do visualise being different one day. I look at my life with abundance, rather than scarcity, even though there are elements that I want to be different. So how can you balance visualising your amazing and ideal life with an appreciation and abundance mindset for the one you have right now? Five steps helped me and maybe they can help you too. Remember – feeling renewed and re-energised for your life is what The Breath Between is all about. You can do that by looking at what you have in your life right now in a new light. A fresh perspective. 1. Embrace a gratitude practice. Be grateful for what something or someone does or is, rather than what it isn’t. You can always find faults, so look for something wonderful instead. If you drive a crappy car and would prefer a Porsche, don’t lament on how horrible it is to get into your crappy car every day. Perhaps try and focus on what it HAS given you instead. Is it the memories of holiday's you've taken, or road trips? Is it that it can carry a lot of stuff and help you move houses? Or, that you've recently put on new tyres, and that means it's like being in a new car. Having a gratitude practice in any area of our life transforms the way we think, and our mindset because it puts us in a more positive frame of mind. When I switched from being negative about how ‘rustic’ my home can sometimes feel (cue: lots of spiders and dirt!) to focusing on filling this bush cabin with loving memories, indoor plants and colour, I felt COMPLETELY different about my space. I'm not saying that you shouldn't imagine an abundant life all of the time, because I think that it is really important to stay focused on what you want, and to have those goals. But setting a dedicated visualisation practice can help balance your dreams with being abundantly grateful for what you have right now too. Having a visualisation practice (I use a dream/vision board and I spent up to ten minutes moving from image to image, imagining my life as I’m living with that element as part of it). I make that time to look at what my dream life is going to look like. What that means for the rest of my day is not that I am looking at my life constantly wishing it were different. Or noticing what I’m yet to have. I have that precious time to do that and it stays with me always, but it doesn’t mean I’m not able to appreciate what I have right now. Sometimes when you visualise your life you see your children at a particular school, your house and garden looking a particular way, you work for yourself or you are in a dream career. What about the little things too? Our bush cabin is on quite a steep bush block and it can be really frustrating when you just want to play backyard cricket (it’s an Aussie thing…). But even without the traditional ‘backyard’ we have patches of ground that are perfect for cubbies, and we have native Australian animals that adorn our land that we wouldn’t have in the flat suburban backyard. Those patches of flat land may be ‘little’ but we get echidnas to go along with it! And wildflowers. What little things can you notice and appreciate and even love about the life that you live right now? If you are not living what you would describe as your ‘ideal life’, know that even though you may not be able to make drastic changes (hello winning Tattslotto?) you can always make small ones. Don’t doubt how small changes can make you feel more abundant or more grateful for your life right now. Small changes might be learning about something new from a book, if you're thinking about a career change or wanting to go to university to train in something new. It might be doing some gardening, or a lick of paint in a room in your home, if it's a space that doesn't feel comfortable or right to you. This was a huge game changer for me. I decided that enough really was enough for me right now. That what I had was enough for me to be happy. Once I decided and I accepted that the drastic changes may not come about overnight, I was more at peace with my life right now. Don’t get me wrong. My visualisation game is strong. I practice every morning and I know where my life IS heading. And I will get there. I have plans for rebuilding our home, for adding a studio, having the permaculture set up for our home and garden, driving two electric cars. The works. But I made a decision that I could be happy, grateful, and present with the life that I have right now too. So I ask you, when is your enough, enough? What is it about your life that you can appreciate, and how can that make you feel renewed about the way you live your life every day? This is what I intend for my life in 2018. More of these moments. What do you intend for yours?